This year The Word Works Washington Prize submissions have come from 47 of the United States, a record for us, and it seemed like a good time to celebrate the steady progress of The Word Works from regional to national organization. In 1981, The Word Works led by Deirdra Baldwin, founding president, while intent on honoring our city of origin (Washington, DC), made a conscious decision to move from a regional to national literary organization. This was done in 1981 through the establishment of an annual literary competition named The Washington Prize. Initially The Washington Prize operated for seven years as a single-poem contest with an award of $1,000 and publication of the winning poem in a full-page ad in the Poets & Writers newsletter (precursor to the Poets & Writers Magazine). The first prize was fully funded by a grant from the DC Commission on the Arts and Humanities. When Word Works began planning for this competition, no other prizes offering such a substantial monetary award existed. However, much to Karren Alenier’s surprise was a call for the first Billee Murray Denny Award, which also offered $1,000 for a single poem but no promise of publication. Suffice it to say, Alenier entered the Denny Award and won that prize. Statistically in 35 years, The Washington Prize has been awarded to 35 poets (20 women and 15 men), living or based at the time of the award, in 21 states or the District of Columbia. This represents 44 percent of the 50 United States and the District of Columbia. 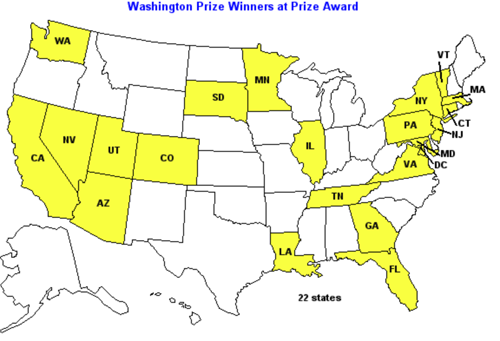 States with more than one Washington Prize winner include New York (6), Massachusetts (5), Pennsylvania (3), and Virginia (3). We attribute this preponderance of East Coast winners to our advertising in Poets & Writers Magazine, but as we have expanded our base of operation (our current president Nancy White lives in upstate New York, vice-president Rebecca Kutzer-Rice lives in Brooklyn, other Board members live in Maryland and Virginia) and purview (annually since 2009 we have exhibited at the Association of Writers & Writing Programs (AWP) Book fair, we have been able to attract submissions from other regional areas of the US. The Washington Prize is open to Canadian poets writing in English. To date, we have awarded one prize to Canadian Mike White who lives and teaches in Utah. The Prize has always been open to Americans living abroad. In 2013, we awarded Molly Bashaw, who maintains her American anchor in Vermont, but lives in Germany. Still, we urge our authors to stay connected to The Word Works by giving readings in our venues, report on their successes, and volunteer for our projects, which includes reading for The Washington Prize. While we continue to work on reaching out to North American writers writing in English, we believe we have been faithful to our goal of publishing outstanding contemporary poetry while moving from a regional publishing house sponsoring public literary programs to one that is robustly national.